Steven Jones & Thermite - Are They Worth Your Time? This paper examines the research and methods of a retired BYU professor Steven Jones. Thanks to Dr. Frank Greening, Ryan Mackey and Dave Rogers among others. I have quoted your work and/or analysis in this paper. Jones has also interpreted archaeological evidence from the ancient Mayans as supporting his faith's belief that Jesus Christ visited America. In case someone is wondering, the issue here is about the interpretation of evidence, not anyone's faith. Let's skip forward in time. In late 2005 Steven Jones published the first draft, and in 2006 he finalized his first 9/11-related paper, titled "Why Indeed Did The WTC Buildings Completely Collapse?". On September, 2006 Brigham Young University placed Steven Jones on paid leave to review his paper and to see whether it met scientific standards. "BYU has repeatedly said, that it does not endorse assertions made by individual faculty. We are, however, concerned about the increasingly speculative and accusatory nature of the statements by Dr. Jones." Since then, Steven Jones has dedicated much of his time to 9/11 truth, being the main source for any thermite-related WTC demolition theories. He used to be in a group called Scholars for 9/11 truth, which he co-founded with James "Jim" Fetzer. In late 2006, however, an open dispute emerged between Jones and Fetzer over the direction the organization should take. Fetzer wanted to promote the more exotic conspiracy claims, while Jones wanted a more careful approach towards the extreme theories. As a result, Steven Jones chose to depart ways with Fetzer and form his own group, called Scholars for 9/11 Truth & Justice. Steven Jones is also a co-editor of an online publication called The Journal of 9/11 Studies. But is the work of Steven Jones really as scientific as they want us to believe? Can we trust his research? 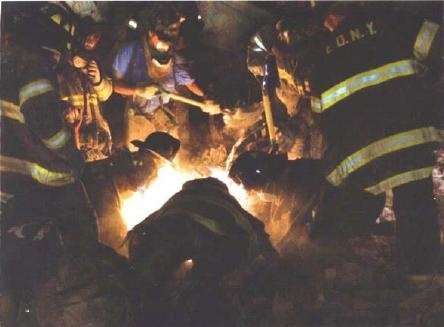 He titled the photos as: "Workers evidently peering into the hot ‘core’ under the WTC rubble”. However, the original caption of the second photo reads: "Investigations began as the wreckage was cleared" and what we see are iron workers clearing the site. Now, why would Jones alter the title so completely to give it a totally different meaning? As you can see, it is not a hot core they are looking at. These are rescue workers using a bright light. There is a video that very clearly shows the workers using the light, but the video has been removed from YouTube and cannot be located at the moment. Nevertheless, the point is proven by this photo showing one of the workers moving the portable light. Jones has later retracted his 'workers peering into the hot core' claim, saying he got the first photograph from a magazine article. The magazine was Geo Magazine, a European publication with no connections to conspiracy theories. Where did he get his idea of a hot core? The second photo was taken from BBC website. He has withdrawn the first photo, but still uses the second photo with the iron workers and writes: “The photo may show the glow of hot metal in the rubble”. He still wants to keep the door open. So now we know that he can be misleading in interpreting the results the way he wants to see them. Could this be a pattern we can see throughout his entire research? Steven Jones claims he is in possession of dust samples from the WTC site, and that those samples contain thermite residue. He got his first dust sample from Janette MacKinlay, who is also a member of the truth movement. MacKinlay sent the sample to Steven Jones by mail. "The provenience of the dust sample used in my study is from an apartment at 113 Cedar St. in New York City. This fourth-floor apartment was the residence of Janette MacKinlay and was approximately 100 meters or so from the closest Tower the South Tower ...(snip)... Janette told me that she had a sense, almost a spiritual or reverential feeling (knowing the origin of the dust) to preserve some of it, which she did, placing dust from her apartment into a plastic bag. My first 9/11-related paper appeared on-line in November 2005, and Janette MacKinlay soon learned from it that I was seeking WTC dust and other samples for study. She contacted me and sent me a small sample by mail." This dust was exposed to all surrounding conditions for a minimum of nine days before being collected. From MacKinlays writing: “We headed back to our place on Thursday, September 20th”. "I (Jannette MacKinlay) moved to New York in September of 1997 with sculptor Jim Lecce to curate art shows featuring both New York and California artists. What was initially going to be a three-month stay turned into four years. Our art loft was directly across the street from the World Trade Center complex." The dust sample is taken from a household of a man, who was possibly using welding gear to make sculptures. Welding gear can create the iron spheres Jones is talking about. Even the possibility of contamination of the dust samples with dust from his clothing hasn't been ruled out, or even addressed. And this sample was the main piece of evidence he built his theory on. Dr. Jones's latest dust update contained a radically different selection of elemental species, none of which are inconsistent with earlier studies such as Lioy et al. It is also worth mentioning, that a WTC-7 special aired by the BBC in the summer of 2008 mentioned that Jones obtained additional dust samples from someone who found it atop a fence in New York City. If you want to see a more detailed discussion about thermite and analysis of different samples, see this discussion thread at JREF forum. People over there are anonymous, but their analysis are valid. Steven Jones has been pushing his theories since 2005. But he gives us only bits here and pieces there without any continuous transparency regarding his tests and methods. And nobody outside his camp has ever had access to his dust and metal samples in order to test or verify his claims. In his 2008 "Microspheres and Temperatures" paper Jones presented three different spectra of spherical particles (he has found even more spectra not mentioned in the paper). Jones's thermite/thermate theory is effectively debunked by the great variety of spectra of iron-rich microspheres in the WTC dust. This proves the spheres came from many different sources. If some of these sources were present before 9/11, e.g. in construction debris from welding and cutting operations, Jones needs to show us how he can distinguish between such particles and particles produced in the WTC fires. Instead of considering any of these natural alternatives, he keeps insisting that he has found traces of thermite. The only certain signatures of thermite would be unfired devices, remains of fired devices (e.g. containment vessels, which have not even been hypothesized), large "pigs" of formerly molten iron, or particular melting failure modes found in recovered steel. Absolutely none of these signatures was found anywhere. And they were looking for them. Many conspiracy theorists also claim, that there was molten material underneath the piles for weeks or even months, which is proof of thermite being used. The problem with thermite is that it tends to burn all at once. The thermite reaction is characterized by its tendency to burn completely. So, if it was thermite, why would it still be burning months afterward? And in such enormous quantities? The Journal of 9/11 Studies (an interesting detail is that the acronym for the journal turns out to be JONES) is an online publication, which has published several papers critical of the so-called official 9/11 story. The co-editors of this Journal are Steven Jones, Kevin Ryan, and Frank Legge. 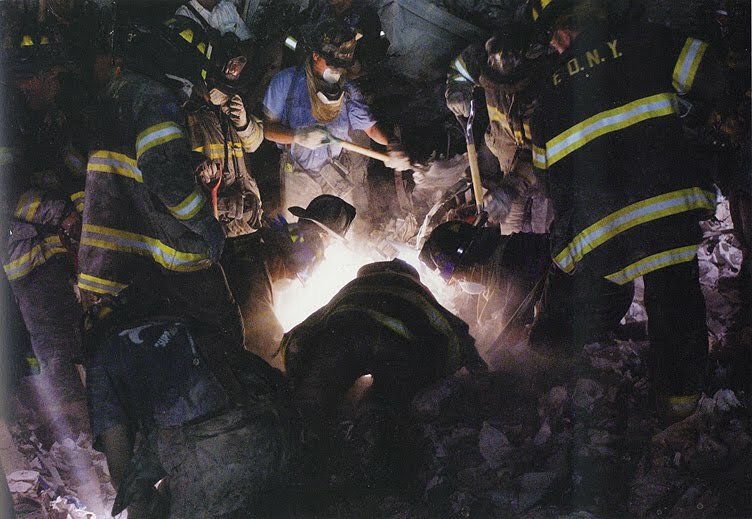 They have described their mission being as follows: "Our mission in the past has been to provide an outlet for evidence-based research into the events of 9/11 that might not otherwise have been published, due to the resistance that many established journals and other institutions have displayed toward this topic. The intention was to provide a rapid acceptance process with full peer review." However, it has been quite obvious from the very beginning, that most of the so-called peer-reviewers are none other than other members of the same organization. In other words, they are peer-reviewing each others' papers. In August 2008 they claimed they have ceased accepting more papers, and released this statement: "It is now our belief that the case for falsity of the official explanation is so well established and demonstrated by papers in this Journal that there is little to be gained from accepting more papers here." This statement is still on their front page. Why is this significant? Enter Gregory Urich. One of his papers, titled "Analysis of the Mass and Potential Energy of World Trade Center Tower 1". was published on JONES in December 2007. Gregory Urich is a member of Steven Jones group called Scholars for 9/11 Truth & Justice. But Mr. Urich does not blindly accept everything other members of the truth movement are promoting. He has written three other papers that he wanted to publish on JONES, but they have all been refused. But we want you to read those other papers by Mr. Urich, so you can draw your own conclusions for the reasons JONES refused to publish these papers. Could it be that there was never any intention to cease publication at JONES, and the message was simply a smokescreen to cover up the fact that they were rejecting these papers that didn't support their agenda? Steven Jones Papers in “Peer Reviewed Publications"
Jones has recently been very proud of his two papers that, quote: "have been published in mainstream peer-reviewed journals: Fourteen Points...[Bentham] and Environmental Anomalies at the World Trade Center: Evidence for energetic materials [SpringerLink]". Mr. Ryan Mackey has contacted the editors of both of these journals, noting that the papers offer no hypothesis, no new data, and no new analysis; that they ignore previously published and reviewed works that would readily clear up their confusion, were they aware of and competent in understanding them; that their papers lack proper citations and references, and are inherently unrepeatable. "Sofia got me looking at chemtrails for example. And I'm not ready to talk about that too much, I have actually made some observations. I have not (unintelligible) what's in those trails, but some of those do certainly last longer than others. And that's... I could go into that a little bit, but I think that that's a valid area and it's not 9/11 but it is truth." Jones was also apparently involved tangentially, at least, in perpetuating an archaeological hoax just prior to his becoming involved in the 9-11 truth movement. Read more about this subject here. There is valid criticism toward Jones’s research and interpretation of evidence dating back to 1980’es. After publishing his first 9/11-related paper, BYU cut ties with him and he was placed on paid leave, only to agree on his retirement six weeks later. He has misrepresented photographs taken from main stream sources to support his conclusions. The dust sample he built his theory on was collected a minimum of 9 days after 9/11, all this time being exposed to all surrounding conditions including welding at the WTC site, and mailed to him from a household occupied by a sculptor artist working with metals that would produce the same particles Jones has found. His methods are not transparent, nobody else has tested his samples. He has found multiple spectra, indicating the spheres have come from different sources. Ignores all natural explanations for his findings, insisting he has found thermite residue. Runs a “peer reviewed journal” that does not accept any material not supporting their agenda. Claims to have two articles published in peer-reviewed main stream journals, when in reality these publications publish papers for money and lack scientific conduct. Do you still believe in thermite?